This summer at the zoo we are teaching guests about the environmental benefits of eating locally, and in an earlier blog post we talked about how we also try to feed our animals locally produced food as well. 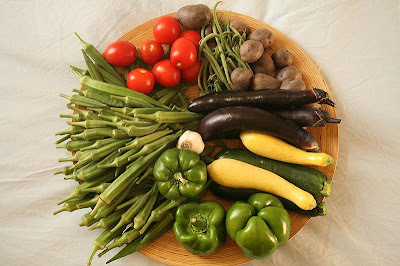 But where the food comes from is just one part of this sustainable story--we're also very involved in where it goes. 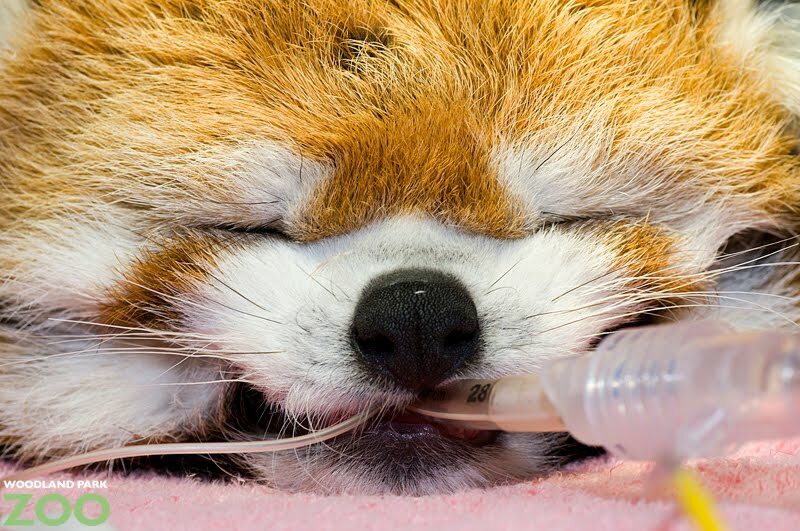 As animals process their food, their bodies take in the vitamins and nourishment they need to live and thrive. The rest ends up as waste. And at the zoo, that’s the makings of some prized material…Zoo Doo. Zoo Doo is finished, dark and rich compost with some woody material remaining. 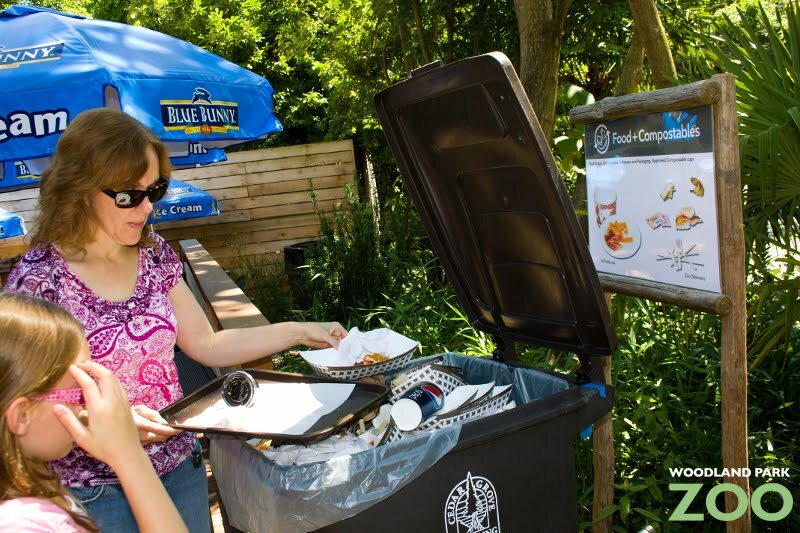 Woodland Park Zoo creates nearly 1 million pounds of compost each year saving $60,000 per year in disposal costs. The zoo’s non-primate, herbivore animals’ manure is used for this process. This includes the elephants, hippos, zebras, giraffes, gazelles, and oryx among others. The Zoo Doo process begins when fresh manure and straw bedding are collected from animal enclosures. Next, leaves, wood chips and other organic materials from the zoo grounds are combined with the manure and straw mixture. When this material is watered and piled into long rows, it quickly heats up, reaching 150+ degrees! The high temperatures destroy pathogens and weed seeds. The piles are turned and watered until the mixture becomes dark and crumbly, bearing little resemblance to the original components. After three months, the compost is cool and ready for use in home gardens. 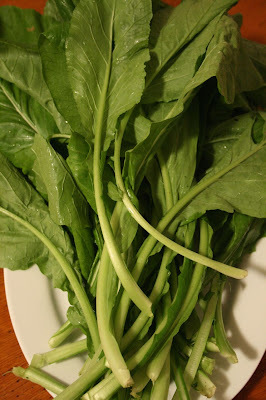 Adding this rich, dark Zoo Doo to your soil will enhance water and nutrient retention, and will improve soil texture. It is a completely organic soil amendment that will help your garden grow your own locally produced food just like our animals eat. Entry cards will be selected randomly for as many entrants possible. Dr. Doo will contact the lucky drawn entries only. For more information on the lottery, pick up dates and Zoo Doo costs, see our Zoo Doo website. 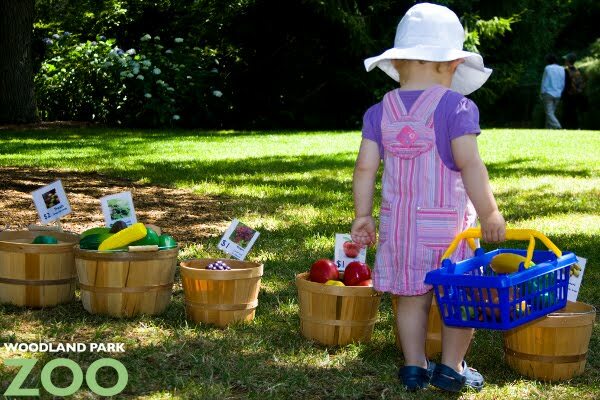 You can also get your hands on small buckets of Zoo Doo at either of our ZooStore locations and get started on growing your own produce right away. 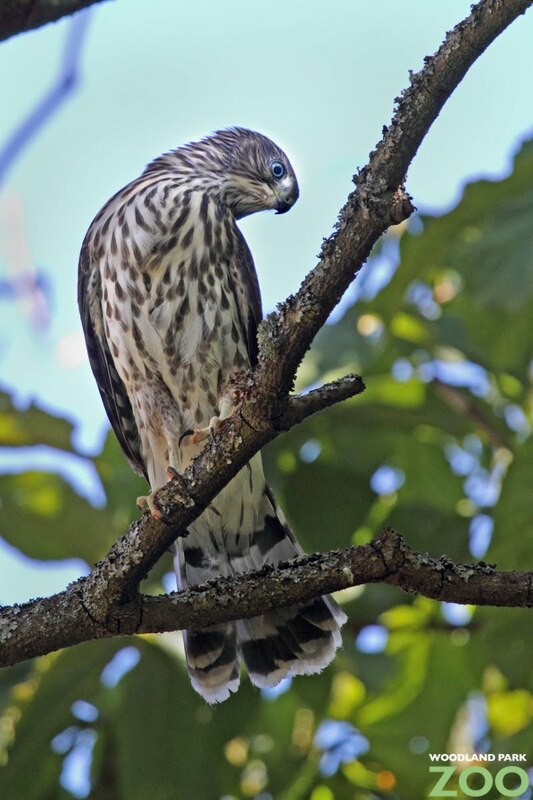 Whether you are a native Seattleite or a visitor to the area, if you haven’t made your way to the intersection of Fremont Ave and N. 50th St, you ought to add it to your list of things to do. 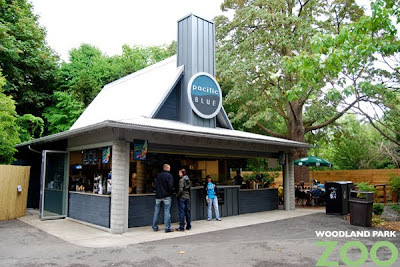 It is there you will find the South Entrance to Woodland Park Zoo and one of Seattle’s oldest treasures. Established in 1924, the city’s 2.5 acre Rose Garden was developed with the intention of serving as a “civic garden.” It was to be a place for urban dwellers to enjoy a serene respite as well as learn about roses that perform well in our Pacific Northwest climate. 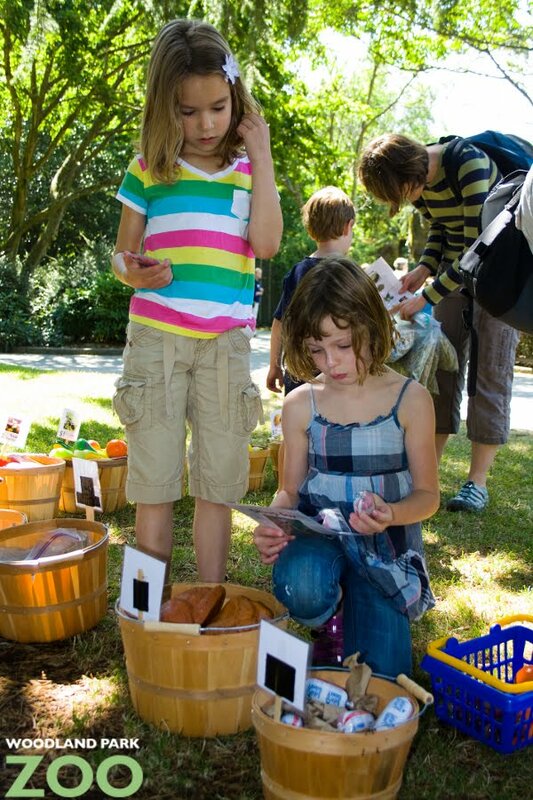 The garden has always had an educational aspect to it and, to this day, that mission remains strong. At a time when issues of global environmental sustainability are at the fore, it is exciting to see efforts being made in our shared backyard. Here, in our beloved garden, we have implemented a new and holistic approach to natural landscape management. The idea is to look at the garden as an interrelated set of conditions all of which should work together to produce the healthiest possible environment for growing roses. To this end, we began with our soil. The first step, no matter one’s ultimate gardening goals, is to test the existing soil to determine just what growing medium has been established. Different plants have different needs so it is essential to find out what you have in order to know what you need to do (or not do) to create the right conditions for optimal plant health. We have consulted soil experts and continue to test our soil every 3 months. It is important to keep track of changes in the soil’s chemistry and biology to determine if things are moving in the right direction. The key to healthy soil is the right balance and availability of nutrients (for the intended “crop”), proper pH levels, the existence and activity status of beneficial microorganisms, and good moisture content. These are difficult things to measure without professional guidance so I recommend our visitors contact http://www.soilfoodweb.com/ for their individual testing needs. We have also considered the specific needs of roses. In addition to healthy soil, they prefer deep watering and good drainage, warm/dry temperatures (not always the case in the PNW! ), regular fertilization, proper pruning for maximum air circulation, winter protection, and seasonal upkeep. We have thus, among other things, switched to an underground watering system; we choose varieties that do well in our temperate climate (and continue to replace those that prove otherwise); we apply pulverized fish fertilizer in small doses each week (much as we take supplemental daily vitamins rather than large singular doses of found deficiencies); we prune very hard at the end of February to remove all diseased foliage from the garden and encourage lots of new growth each Spring; we mulch all crowns each fall to prevent freezing; and, of course, we deadhead, deadhead, deadhead in order to provide our visitors with the longest show possible. I am often asked how we control insect pests. It is an easy question to answer: we don’t have any pests. 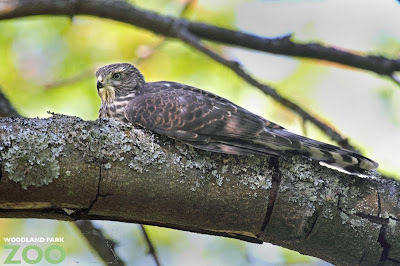 When a landscape’s natural life forms and cycles are left alone, a balance of prey/predator is usually the result. That is the case in our garden. Black spot, on the other hand, well…it’s our arch nemesis! So, what do we do? We concentrate on plant health care and control what we can. When disease sets in, we get rid of the worst of its victims and tolerate a certain level of imperfection. Rust, Powdery Mildew, and Rose Mosaic Virus make brief appearances during the growing season, but they are usually restricted to a few isolated varieties (which we may ultimately eliminate if they begin to succumb entirely or their aesthetic value is too seriously compromised). 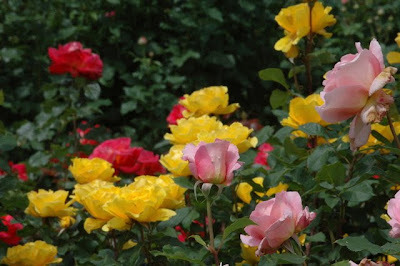 Remember: a picture perfect rose is most likely doused in pesticides. Which would you rather, a bit of Black Spot or a toxic environment? This may all seem very labor intensive but, truth be told, roses are pretty hardy and they do most of the work on their own. With our overall view of the garden as a whole system, we take it one step at a time, one season at a time. We have every reason to believe our new approach is working. For proof, come to the garden and see for yourself! 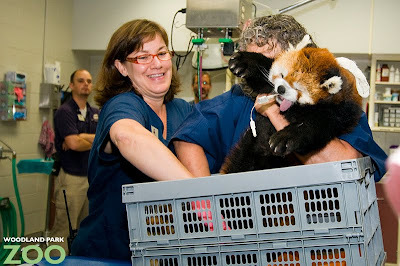 Photos by Agnes Overbaugh and Ryan Hawk/Woodland Park Zoo. 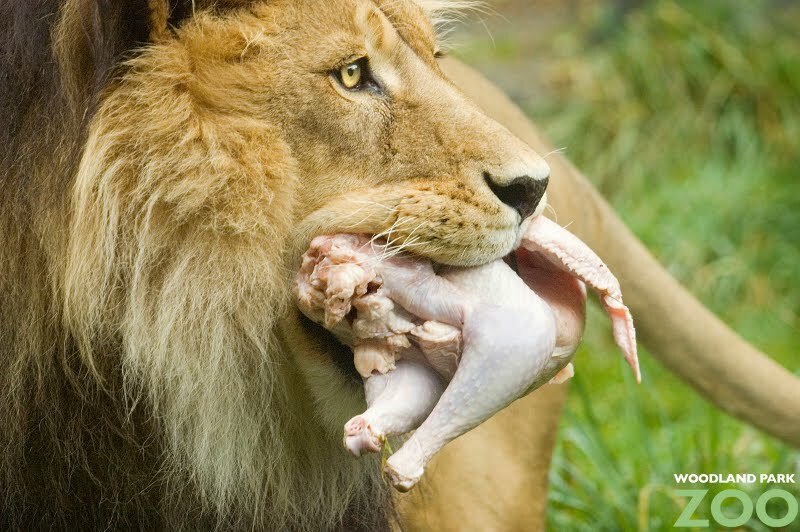 Lions, tigers and jaguars eating less red meat at the zoo? Who would have thought?! But if you think about it, carnivores in the wild will catch and eat the occasional fish or fowl to supplement their diet, so why not in a zoo? All of the zoo's carnivores receive a commercially prepared diet that meets their nutritional needs. These diets consist of red meat and are fed most of the week. However, there are some benefits to eating whole chickens or turkeys once a week. The bones in uncooked fowl help keep their teeth clean and the animals welcome the variety. Chickens can be offered to the animals in interesting ways. 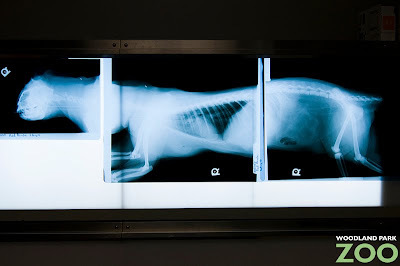 They can be hidden in the exhibit or hung from a spot where the animal has to reach for it. By reducing the red meat our carnivores eat we're not only improving their overall health, we’re also helping the environment. Researchers have determined that 2.5 times more oil is used in the production of red meat than with chicken. For example, by not eating red meat just one day a week, a person would conserve the equivalent amount of oil needed to drive 1,155 miles. Woodland Park Zoo is always looking for ways to reduce its carbon footprint and every department at the zoo is doing their part. 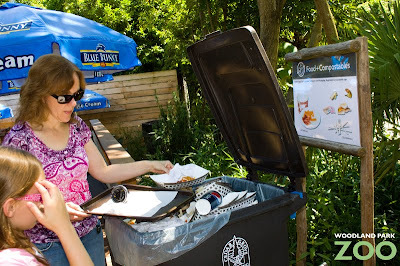 For more on how we are greening our operations, see our Green Zoo website. Woodland Park Zoo is a photographer’s paradise so take your best shot and enter it for a chance to win the cover of Woodland Park Zoo’s 2011 calendar, hitting member households this November. 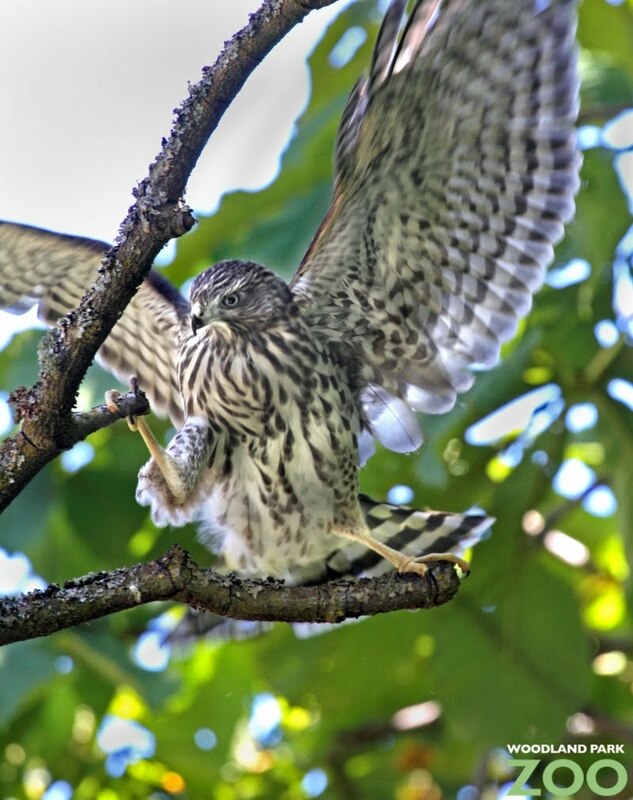 Photographers—amateur and professional alike—are invited to submit their best animal photograph taken at Woodland Park Zoo. To enter, upload your photo to http://www.zoo.org/calendar-contest from August 16-30. 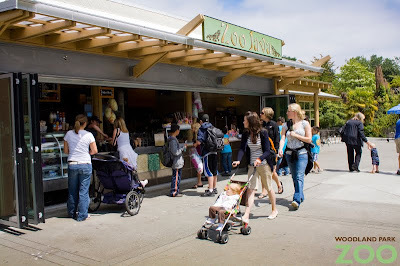 Zoo judges will select their top 10 choices and open up the final voting to the public. Voting takes place online from Sept. 7-10, when the finalist photos will be posted to the zoo’s Facebook page. There you can cast votes by clicking a photo’s “Like” button. The photo with the most “Likes” as voted on by zoo fans will win the cover shot and a prize package including a one-year zoo membership for two adults and two children, plus a $50 zoo gift card. What makes for a winning photo? We’re looking for photographs that showcase the beauty and drama of the animals at the zoo. Think about the composition of your photograph, the clarity of its subject, and the story it tells. For inspiration, take a look at the photos on our blog or the numerous photo albums on our Facebook page. 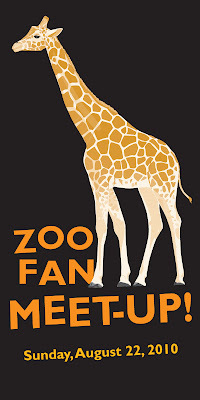 For full rules and entry instructions, see www.zoo.org/calendar-contest. Good luck! 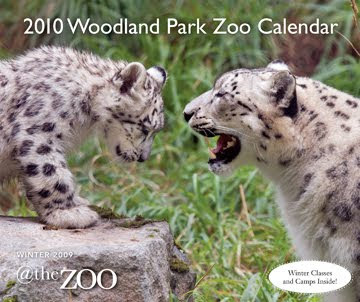 Photo: 2010 calendar cover by Dennis Dow/Woodland Park Zoo. 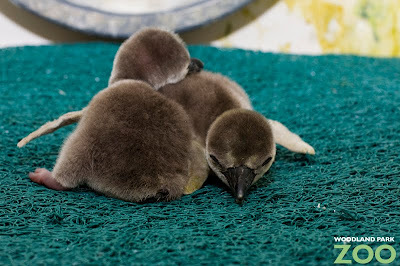 With five chicks hatched in April, we were thrilled with the breeding success of our endangered Humboldt penguin colony in just the first year of their new exhibit. Well, now there’s even more to cheer. Two more penguins just hatched at the start of August! 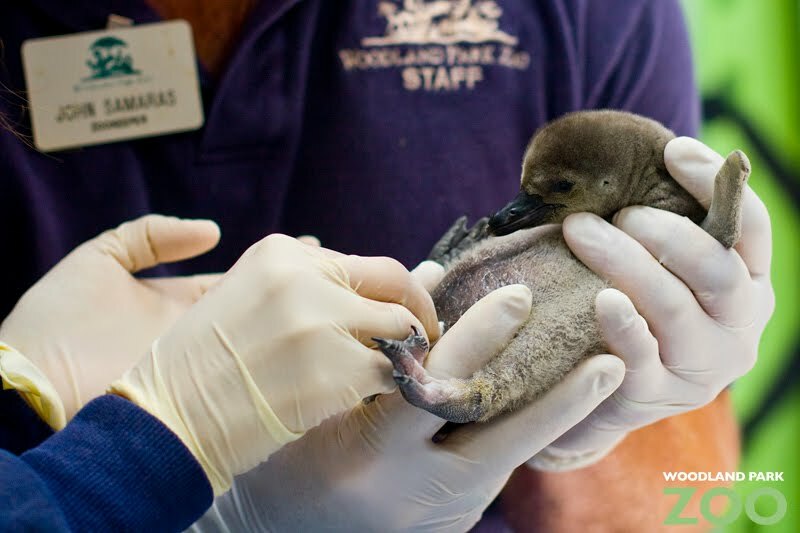 The keepers regularly weigh the chicks to ensure they are achieving acceptable weight gains. At the weigh-in today, the 12-day-old chick came in at just over 1 lb and the 9-day-old chick at 0.6 lb. They looked healthy and it seems their parents, 18-year-old mother Cujo and 20-year-old father Oedipus, are properly caring for them in their off-exhibit nesting burrow. The parents are among the oldest penguins in the zoo’s colony and also the most genetically valued breeding pair at the zoo. 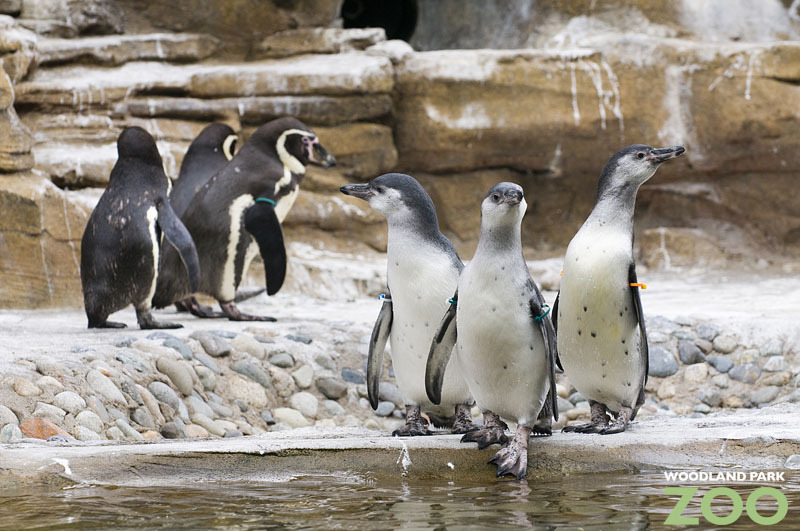 As part of our work in the Species Survival Plan for the endangered Humboldt penguins, ensuring such genetic diversity is critical to the stability of the population. 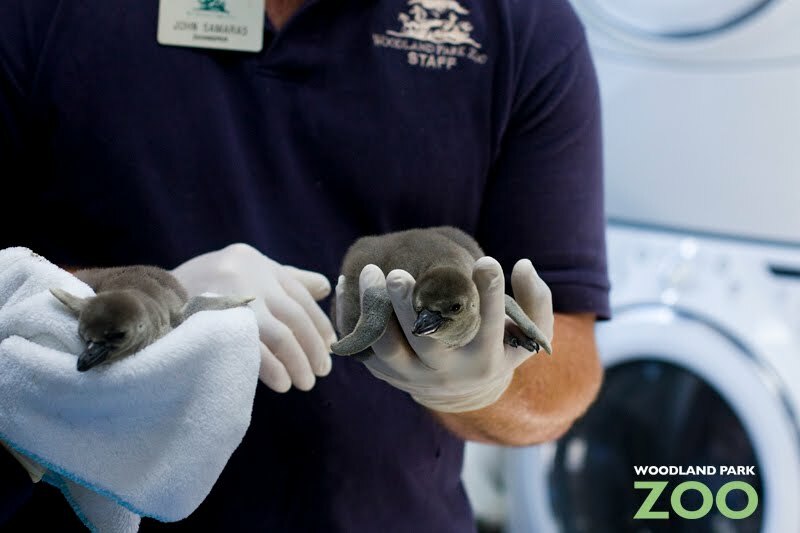 The two chicks will stay under the care of their parents for a while longer, and then will start their swim practice and food training with their keepers behind the scenes. 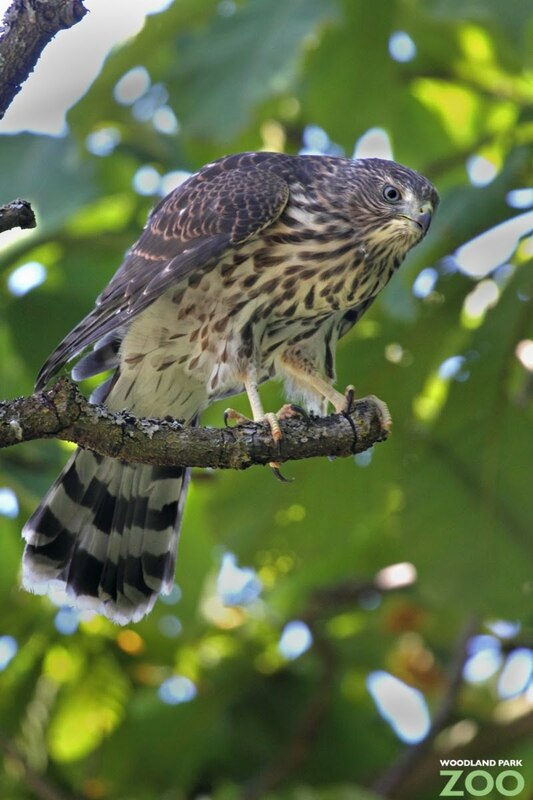 The keepers will train the birds to approach staff for hand feeding and to allow close-up visual inspections. This is the first nesting and breeding season for our colony of Humboldt penguins since the exhibit opened last May. 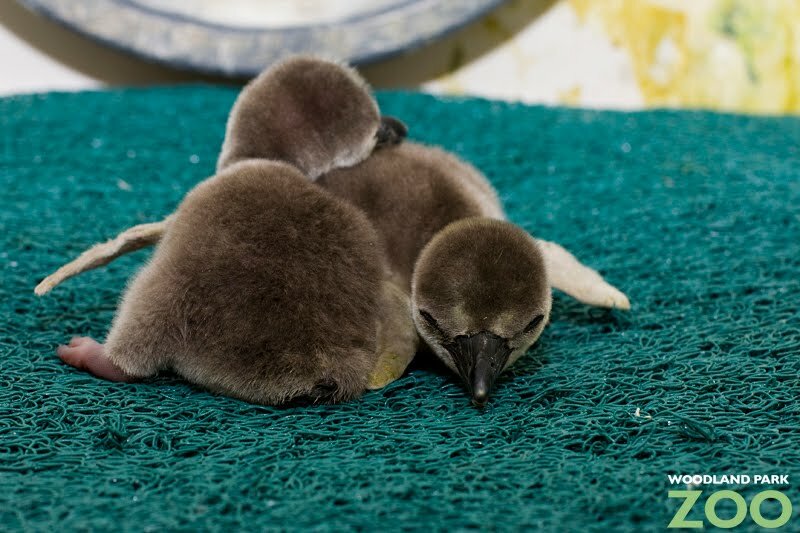 The five older chicks—including Pisco, the chick named by our Facebook fans—joined the adult penguins on exhibit in early July. You can tell them apart by their lighter, more grayish feathers. It will be several weeks before the two youngest chicks are ready to join the colony in the exhibit. Top photos by Rachel Gray/Woodland Park Zoo. Bottom photo and video produced by Ryan Hawk/Woodland Park Zoo. The endangered snow leopard is elusive and hard to study in the wild. So researchers with the Snow Leopard Trust, a Woodland Park Zoo conservation partner, are testing with us a new method of luring these felines to research sites—Calvin Klein Obsession for Men. Today, we tested the appeal of the cologne on our 1-year-old cubs Gobi and Batu, and their mom Helen. 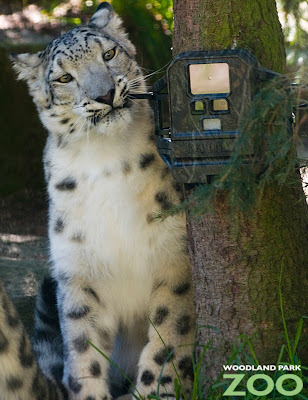 We installed a camera in the snow leopard exhibit and sprayed the cologne around the area of the camera in hopes of capturing stop-action images and measuring the reaction of the cats to the lavender, spice and woody elements of the cologne. The results? Well, we wouldn’t quite call it an obsession, but the cats are definitely interested in Obsession. The cologne proved to be a strong attractant…eventually. It just took the cats several minutes before they caught the scent and became interested in it, rubbing up to the areas where the scent was splashed. The novelty of the camera in their exhibit also proved quite stimulating, and the cats spent a good amount of time biting and clawing at the camera. Here's a series of photos taken by the camera in the exhibit, triggered by the movement of the snow leopards. 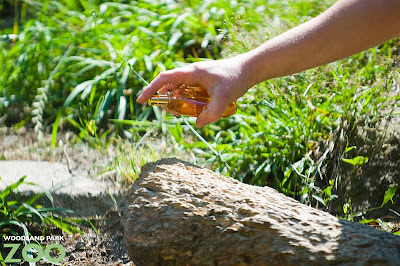 Based on our pilot test, it seems like the cologne could very well be successful as an attractant in the wild. This summer, Snow Leopard Trust will apply the cologne technique to try to attract more snow leopards to research sites in South Gobi. At these sites, cameras like the one in our pilot study will capture images to help us identify and track the wild population of snow leopards. Researchers will also attempt to attract the snow leopards for collaring with GPS trackers in order to learn how they use their habitat, which will help us better understand their needs and how we can protect them. Where did the idea to use this cologne come from? 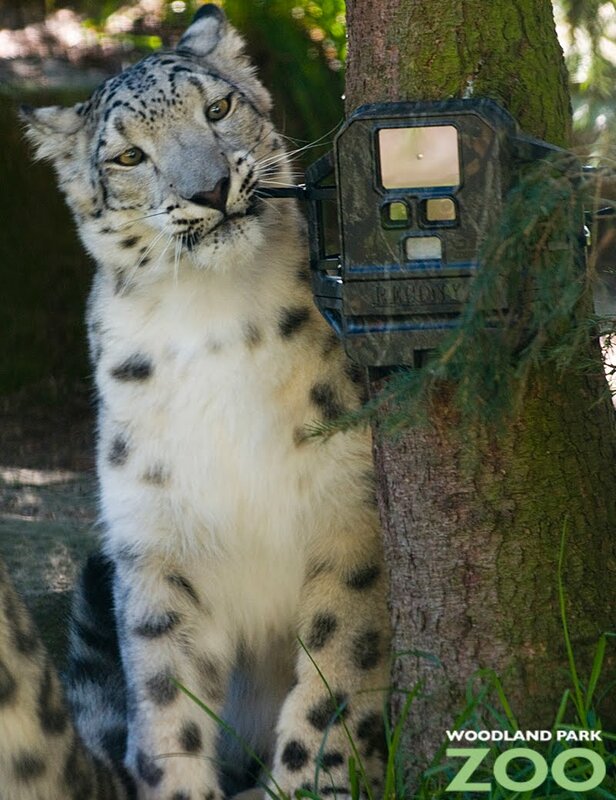 Snow leopards have a strong sense of smell and are stimulated by scent enrichment, something our keepers do with them regularly. But the Wildlife Conservation Society’s Bronx Zoo is credited with discovering the particular potency of Obsession for Men when it applied a variety of perfumes and colognes to trees and rocks in the zoo’s tiger, snow leopard and cheetah exhibits. 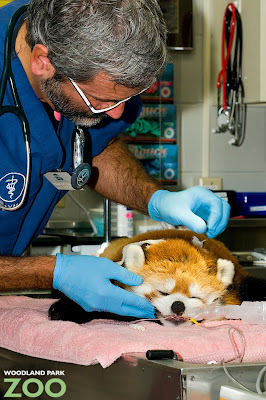 For many of our conservation partners, Woodland Park Zoo is a great testing grounds for field research methods such as GPS tracking, animal cams, and DNA studies. 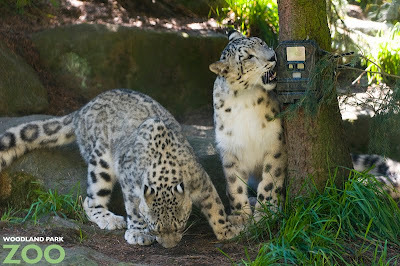 The cologne technique tested today is one of several pilot tests that the zoo’s snow leopards have engaged in to help improve research techniques and conservation efforts for their counterparts in the wild. 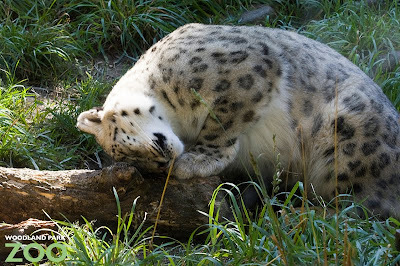 The endangered and very elusive snow leopard will be in the spotlight at Woodland Park Zoo’s fourth annual Snow Leopard Day this Sat., August 14. 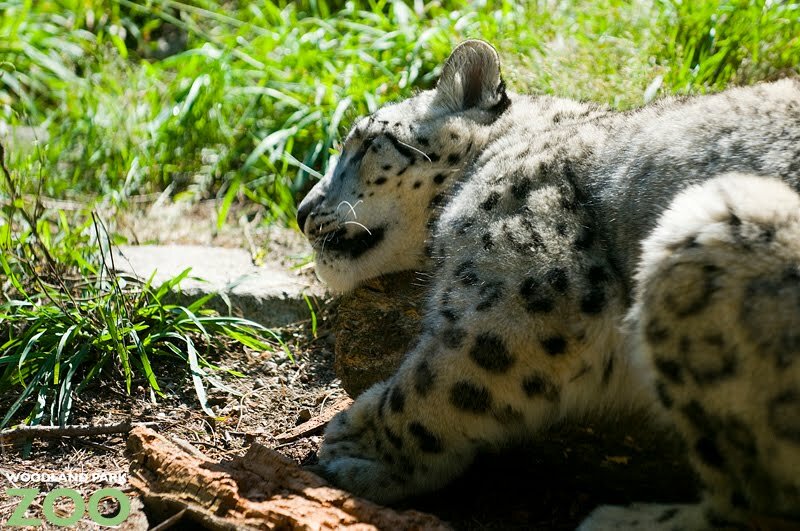 Hosted by the zoo and the Snow Leopard Trust, this full day of activities highlights the fascinating adaptations of the snow leopard and critical conservation efforts to protect them in the wild. Come join us! 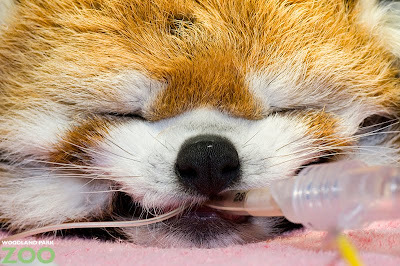 Photos by Rachel Gray and Ryan Hawk/Woodland Park Zoo. If you plan on coming to the zoo this summer, you may see me pushing a cart filled with a colorful array of plastic fruits and vegetables. 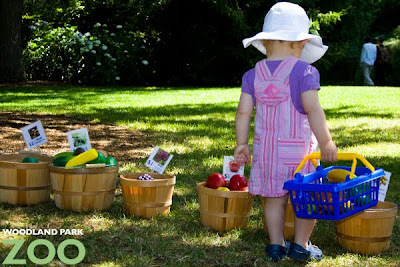 Grab a basket and one of our summer program presenters will show you how to shop. 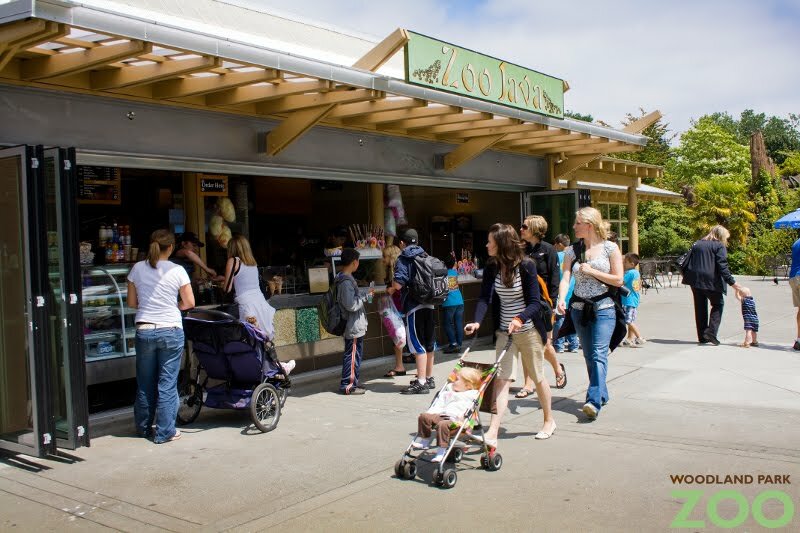 There are 5 different animals from the zoo that you can shop for: a tiger, gorilla, meerkat, brown bear or giraffe. Each animal has different dietary needs in order to be healthy, and a shopping list shows you the quantity and types of food these animals really eat in one day. Depending on the animal you pick, you are assigned a budget with a certain amount of “Carbon Bucks” with which to shop. 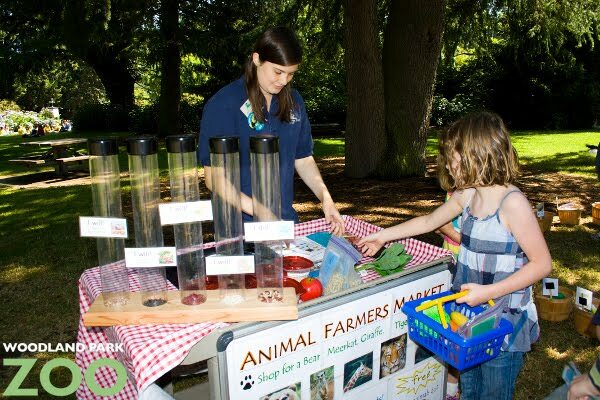 There are a variety of fruits, vegetables, meats and treats in our Animal Farmer’s Market. Each food is assigned a Carbon Buck amount based on the estimated carbon footprint it takes to grow or raise that type of food. The goal of the game is to shop for everything your animal needs for the day while spending as few Carbon Bucks as possible so you can walk away with change! Some shoppers notice that buying local instead of food from far away saves Carbon Bucks. Others shopping with meat on their list see that chicken is much cheaper than beef. These are just two of the many ways you can learn about how our food choices impact environments worldwide. Approximately 1/3 of all greenhouse gas emissions come from the food system, and the methane produced by livestock alone accounts for 18% or all greenhouse gases! We don’t want to discourage people from enjoying a hamburger or steak, but eating locally or lower on the food chain regularly can help animals and people alike. If all Americans went meat or dairy-free just one day a week, it would be equal to taking 20 million midsize cars off the road each year! So come “Shop like an Animal” with me and our other program presenters. It’s already a very popular and fun game; many are shopping for several animals, saving our keepers some valuable time! I’ve had some adults timidly ask if they can shop too, and please do! The fun is meant for all ages. Hope to see you this summer!